Jon P. Mendelson, Chief Operating Officer at Ice Cold Mouthpiece, a US-based healthcare company, had developed an oral cryotherapy device to help cancer patients manage the side-effects of chemotherapy and radiation therapy. He was looking to launch his product in the market. However, he needed supporting documentation for his product, including a compilation of all relevant research articles, clinical trials, and a summary of outcomes. After posting his requirement for a scientific writer on Kolabtree, Jon received 2 bids within 24 hours. 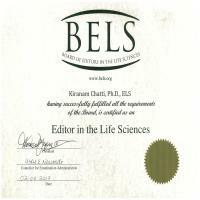 He chose to work with Dr. Kiranam Chatti, a highly experienced scientific writer from India. Kiranam put together a comprehensive report in the required format. Jon then used the report to effectively position and sell his product in the market. He also rehired the same writer for another project. "Immediate response to posting. More than fair prices. Delivered project ahead of schedule. I fully recommend and will use again if needed."